TheValencia Alumni Association held its annual fund-raising 5K race at West Campus on Saturday April 31. 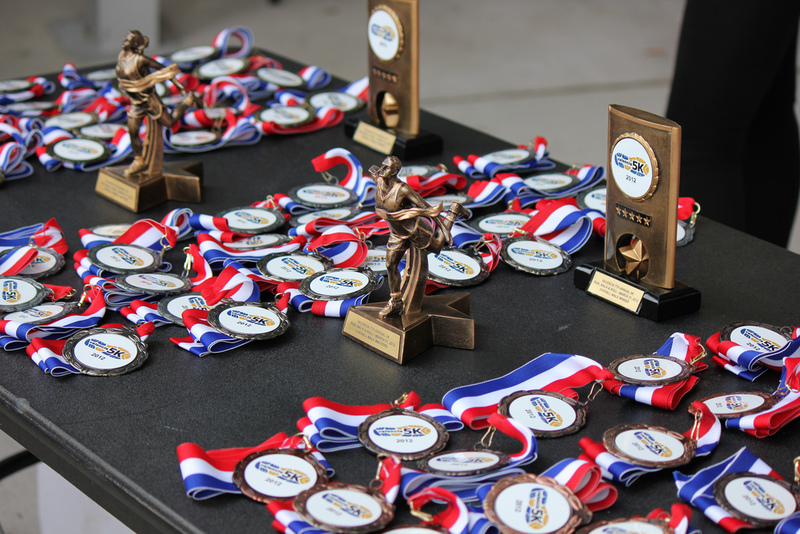 Over 250 runners competed for top placements among different age brackets, with funds raised going to support the criminal justice, firefighter and EMS scholarship programs at Valencia through the Justin Harvey Scholarship. “We’ve gone for general scholarships in the past, and we wanted to target specifics this year,” said Barbara Shell, director of community and alumni relations at Valencia. Shell mentioned the death of offers in the Central Florida area in recent years, and felt focusing on this would help bring the law enforcement community out to show support. 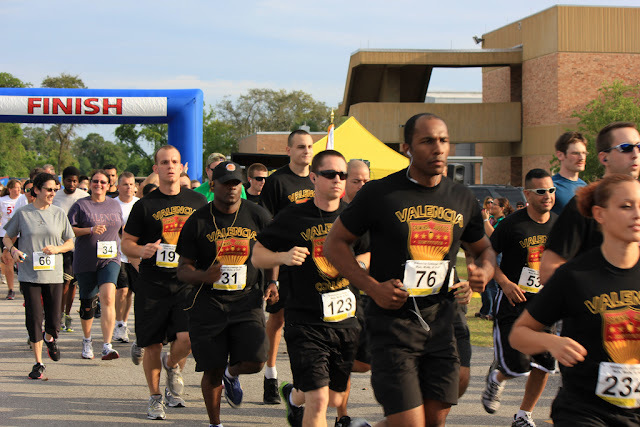 Several uniformed and fully-equipped officers came out to participate in the race this year, along with a large group representing the Valencia Criminal Justice Institute. Sergeant Jason Scott from the Orlando Police Department sang the national anthem right before the race began. “It couldn't be a better cause, in light of what's going on in the community,” said Lieutenant Todd Gardinen from the Orange County Sheriff's Department. The officer mentioned the deadly shooting two years ago of Deputy Brandon Coates in Orange County and the recent death of Deputy Sheriff Barbara Pill in Brevard County, and how these events can bring the community together to help support law enforcement. As the racers stretched and prepared for the 3.1 mile run, they were provided with plenty of bottled water and large slices of oranges to stay hydrated for the race. Last year runners were tracked by somewhat cumbersome ankle monitors that digitally cataloged their time as they raced. The same system was used this year, but with a small flat tracking unit attached to the back of the race numbers that all participants received. Entrances to the campus were blocked off before the race began, and runners took a fast-paced tour of the winding Valencia College Drive that encompasses the West Campus. Some gave it everything they had to achieve personal records and bragging rights, while others took a steady pace, merely participating and not overworking in the humid heat of the day. 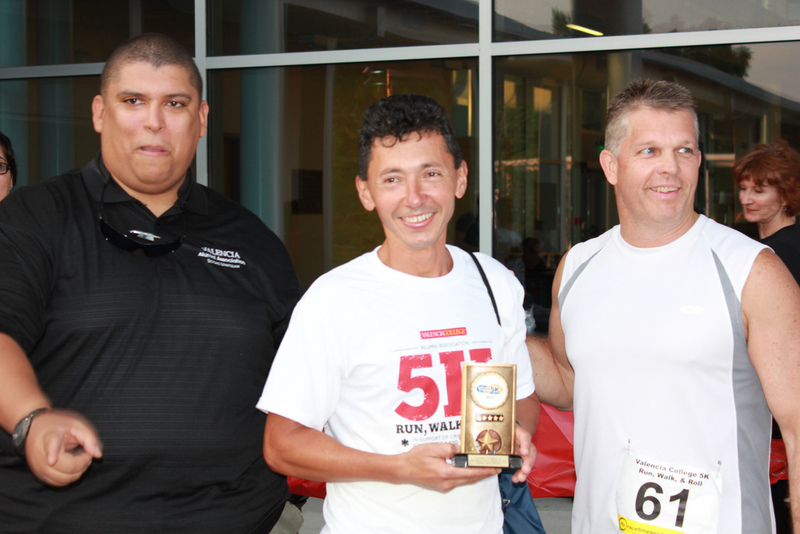 The winner of this year's 5K was Diego Valencia (46) with a time of 18:49.3, almost two minutes faster then the second place finisher, with a pace of 6:04 per mile. “It feels pretty good to win. The last time I finished first overall was about 18-years-ago,” said Valencia. The 30 year running veteran was celebrating and taking picture with fellow racers and friends, and wanted to give thanks to Jesus Christ, dedicating the victory to his glory. Another shining athlete at this event was the top place female racer Beth Jeck (51), who finished fifth place overall with a time of 21:20.3. She has raced in over 100 events in the last 15 years, and maintained a strong composure and positive attitude even after giving this race her all. The funds raised at this years event are still dedicated to the memory of Justin Harvey, who envisioned this 5K event as a Valencia Alumni board member. Harvey became mysteriously ill and was still working on the plans for the first race in his hospital bed. He didn't live to see the first race, but his dreams live on and are fully realized now after years of successful annual races in his honor. 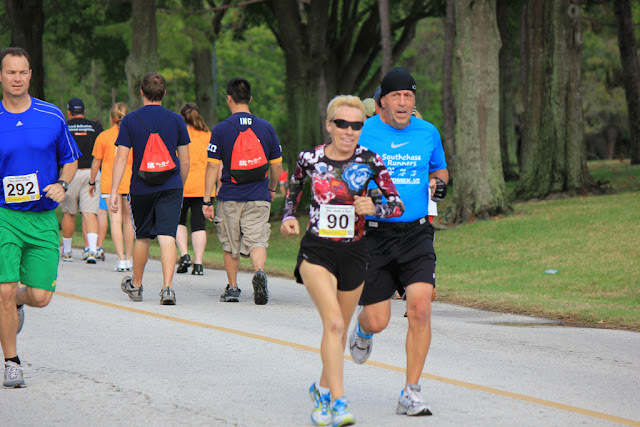 51-year-old epileptic Beth Jeck #90 sprints to the head of the race group to establish her impressive 5th place finish. Diego Valencia is all smiles holding the first place overall finisher trophy a feat he hasn’t achieved in over 18 years. 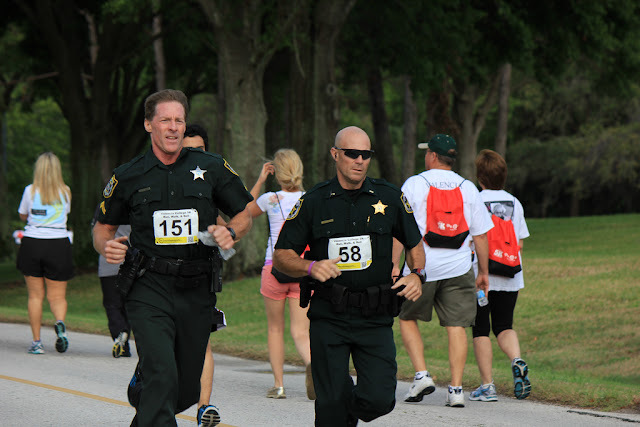 Orange County Sheriff's Department officers join this years race sporting full dress, over 20 pounds of additional gear.